After a week of working harder than I really wanted to I quit a little early on Friday and stopped by Tomahawk Creek (suburban Kansas City) on my way home. I had a couple attempted copies of Anthony Naples Peacock and Brown flies I had tied earlier in the week. They came out a little ragged but worked great. My Soyokaze 27 was the perfect tool for laying the fly in between the rocks to target individual fish. All my tenkara stuff (5 rods) is in a small backpack that is usually with me. I'm continually amazed at the capability in that little bag - micros to carp. I love the gear, obviously, but more importantly I've become addicted to getting out in these beautiful little streams and catching more fish in the last six months than I have in my whole life. Fishing used to be something I did on vacation. 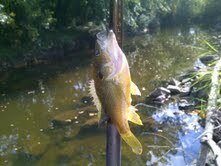 Now I think I could catch a fish within ten minutes of were ever I am in the city. The difference is the ease and effectiveness of these rods. A big thank you to Tenkarabum and all the folks on this site who have shared there enthusiasm for this wonderful way of fishing. Ok, my question is were you fishing from the bank or wading? If wading, was it easy to get to the creek or was it a climb? I'm assuming all this is from the trail in Leawood. I was on the bank Friday but have also waded that section of creek. It has easy access directly across the trail east of the North Leawood Pond parking lot.